Spring Break is here! If you’re staying in town, make the week memorable by including one (or more!) of these local adventures to you schedule. Adventures range from nearby to a couple hours’ drive. Take your pick — these will not disappoint. Take advantage of one of these sunny, warm spring days to take a walk along a path that the dinosaurs themselves traveled 100 million years ago at Dinosaur Ridge. This is the very spot where the first stegosaurus was discovered in 1877! The hike, just over two miles, is an easy, paved stroll with over 300 dinosaur tracks on view. In addition to the famous dinosaur tracks, visitors have the chance to see dozens of dinosaur bones from the Jurassic period, still nestled in the layers of sandstone along the trail. The site will have you imagining the Morrison ridge as it was millions of years ago, a coastal beach on the edge of an ancient ocean. Round out your adventure by checking out the Visitor’s Center and Discovery Center to explore Colorado’s changing landscape over the Jurassic and Cretaceous periods with numerous fossil displays, hands-on dinosaur exhibits, kids dig areas and more. Can’t get enough dinosaurs? Check out this list of 10 places to explore dinosaurs and fossils in Colorado. The walk through Dinosaur Ridge is FREE. For admission to the exhibit halls, the Discovery Center and a 45 minute guided bus tour, tickets are $9/Adults (12+), $7/Youth (3-12), Kids under 3 are FREE. For ticket info, click here. Dinosaur Ridge is located at 16831 W Alameda Pkwy, Morrison, CO 80465. With the Morrison Dino Pass, gain admission to Morrison Natural History Museum as well as Dinosaur Ridge exhibits for a discounted price: $17/Adults, $13/Youth. Sunflower Farm is a rural haven in South Longmont where kids can feed goats, sheep and llama, jump from hay bale to hay bale, play in the corn house, playhouse and sandboxes, explore the tree forts and bridges, hold a chicken, soar down the zipline, balance on the slackline. There is even an old airplane to explore. Open to the public during Spring Break. All activities are covered by a single admission fee of a ticket—no other fees apply. Pre-purchasing tickets is required, tickets available here. Sunflower Farm is located at 11150 Prospect Rd, Longmont, CO 80504. Spring Break Hours 11AM – 3PM. Under 12 Months FREE. Tickets available here. The Ft. Collins Museum of Discovery inspires kids to explore Science, Technology, Engineering & Mathematics with hands-on exhibits and activities. The Tot Spot is the perfect place for little ones to revel. In this amazing toddler-centered exhibit, toddlers and preschoolers will love the giant, interactive train table, sink or float water zone, art center and life sized crawl-through tree. Do your kids love to make noise? Then they will love the Music and Sound Lab. This exhibit allows kids to try out a variety of fun instruments, including a full drum set, guitars, horns and so much more. The Wildlands and Wildlife exhibit features the creatures and lands that existed in Ft. Collins millions of years ago. My kids’ favorite part was hopping into the tornado chamber. A real-life vortex, the chamber is hair-flying fun! There is so much more to this fantastic museum, including live animals, innovations lab, Ft. Collins history, natural areas, and even a dome theater. The museum is about an hour’s drive from Boulder, but well worth the trip! For more on the museum and some suggestions on places to stop for lunch or a treat, click here. The Ft. Collins Museum of Discovery is located at 408 Mason Ct, Fort Collins, CO 80524. The Museum is open Tuesday through Sunday, 10AM – 5PM, Thursday open late until 8PM. Closed Mondays. General Admission prices are $9.50/Adults, $7/Seniors, $7/Students, $6/Kids Ages 3-12, Children 2 & Under are FREE. You can’t really have a list of local adventures without Rocky Mountain National Park! A great escape into nature, the park encompasses 415 square miles of natural settings including some of Colorado’s highest mountains, lush evergreen forests and fascinating wildlife. Kids can check out the Junior Ranger Program and learn more about the park at the Beaver Meadows Visitor Center. Trails will likely be snow-packed and icy, but the drive will be beautiful. Stop for an ice cream cone or a caramel apple in Estes Park on the way home. Entrance Fee to Rocky Mountain National Park is $25/car per day, $35/car for a 7-day pass. Annual Passes are $70 (FREE for U.S. Military) and grant access to more than 2,000 National Recreation Sites for the full year. The Butterfly Pavilion is home to over 5,000 animals! Add this tropical rainforest to your staycation — where 1,600 butterflies live and Rosie, the tarantula is ready to be held by brave children. Step to Water’s Edge to be immersed in an underwater world full of sea creatures. The pavilion also features lovely gardens and a nature trail, as well as an indoor play area and fun gift shop. Butterfly Pavilion is located at 6252 W 104th Ave, Westminster, CO 80020. Open daily from 9AM – 5PM. Admission: Adults – $11.00, Westminster Resident – $9.00, Seniors (65+) – $9.00, Children (2-12) – $7.00, Children (under 2) are always FREE. If you are feeling extra adventurous, take a drive down South to Garden of the Gods! It is a long drive from the Boulder area to Colorado Springs, about an hour and a half to two hours, but well worth the drive. 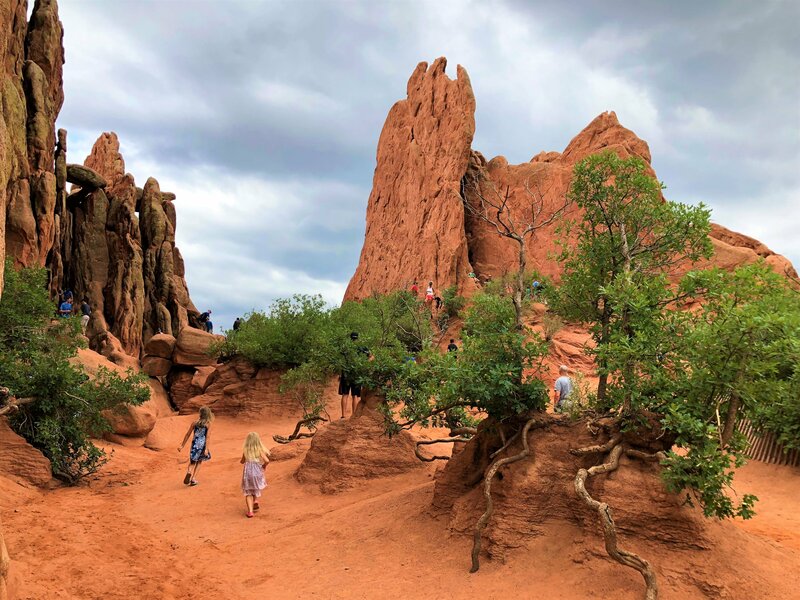 Garden of the Gods has everything from absolutely breathtaking views, intriguing history and easy (and stroller-friendly!) hikes — all for FREE. While some areas are off limits or require a climbing permit, there are a number of spots for the kids to climb, play and explore these fascinating rocks! The national landmark even has a beautiful, large visitor’s center (also free!) complete with geology and historical exhibits, a cafe, gift shop and more. The cafe offers delicious and healthy (and kid-friendly!) food options, as well as a dining room overlooking the gorgeous landscape. Garden of the Gods is located at 1805 N 30th St, Colorado Springs, CO 80904. Open every day in the summer from 8AM – 7PM, in the winter every day from 8AM – 5PM. Closed Thanksgiving, Christmas and New Years. Entrance is always FREE.